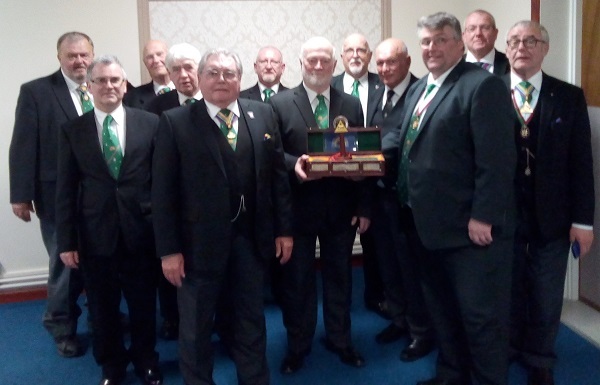 Twelve brethren from St Mary RAM 326 visited Trent RAM 172 on Wednesday 17th April 2019 and claimed the travelling sceptre, which had only recently been claimed by Trent RAM. A raiding party from the Trent Lodge of RAM managed to claim the Sceptre from St Oswald lodge of RAM on the 21st of March in Scunthorpe . Gainsborough now have the Gavel, and the Sceptre, and all those who wish to visit and make a claim will be made most welcome. The Travelling Gavel & Sceptre competitions are open to all Lincolnshire Mark Masons’ or Royal Ark Mariners’ Lodges. To claim the Gavel/Sceptre a minimum of 4 ( four) visitors representing one other Lodge must visit the Lodge in possession of the Travelling Gavel or Sceptre. The visiting Lodge with the requisite number of Brethren multiplied by the distance travelled using the mileage calculator provided by the Provincial Secretary (giving Masonic miles ) will be entitled to claim the Gavel. In the unlikely event of a ‘’tie’’ on number of man/ miles calculated - the Lodge which has travelled the furthest distance will prevail .ie distance from the visitors’ Masonic Hall to the host Lodge using the table of mileages sent from Province. The Gavel or Sceptre should be claimed as an item under ‘’Any other business’’ on the Agenda. The Secretary/ Scribe of the Lodge giving up the Gavel/ Sceptre should inform the Provincial Secretary where it is now residing and ensure the black mileage Log enclosed is completed before passing it over to the new incumbent.The Secretary/ Scribe of the Lodge taking charge of the Gavel or Sceptre should inform the Provincial Secretary that they have it in their safe-keeping and when the Lodge next meets to enable it to be claimed. Every effort will be made to publicise the next meeting Provincially to encourage as many visitors as possible. 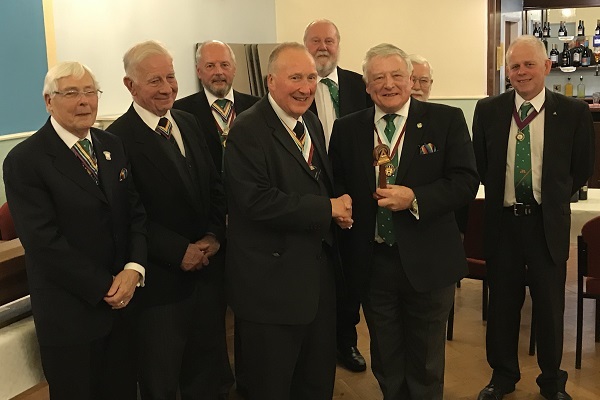 At each Annual Mark Provincial Grand Lodge meeting the Gavel should be presented to the Provincial Grand Master for the duration of the Meeting by the Worshipful Master of the Lodge or one of his Wardens or a senior Past Master. The same procedure will apply to the Sceptre at the Annual Royal Ark Mariner Assembly. Both the Gavel and Sceptre are in the custody of the Mark & RAM lodges in Gainsborough at the moment this is only the second time they have been in the same masonic building since instigated by W.Bro Alan Birkett from the St Oswald's lodge in Scunthorpe.